Five-year-olds are often full of curiosity and energy. Many love to talk and are learning new things at a rapid rate. At five, children are usually very imaginative and love stories. This can make it a great time to begin teaching children to read. Below are some fun ideas for teaching your 5-year-old to read. In order to teach your five-year-old to read, your child first needs to learn letters, letters sounds, simple words and word parts. Reading to your child on a regular basis is one of the best ways to increase your five-year-old's understanding of language, phonics and meaning. Rhyming books are a great way to have your child practice reading without actually having to know how to read. Begin by reading the book once through. 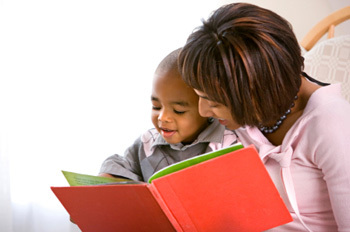 Then ask your child to help you read it a second time by saying the rhyming words aloud with you. Phonemes are the sounds that the English language is composed of. Although here are 26 letters in the alphabet that your child must learn, there are approximately 45 phonemes. If your child is aware of these phonemes either on a conscious or subconscious level, learning phonics, word parts, sight words and vocabulary will be greatly simplified. Teaching phonemes can be something that happens very gradually. Begin by having your child sound out words. The word 'cat', for instance, has three phonemes: /c/ /a/ /t/. Practice frequently so that your child is able to identify individual sounds in any word. Create labels for objects in your home. Make it fun by letting your child help make creative labels that you tape to the items themselves. Encourage your child to read the label each time he or she uses the item. While sitting in traffic, have your child read as many signs as she or he can. First, your five-year-old can say the individual letters out loud. Then, he or she can guess what the sign says. Many times, your child will get hints from context clues, such as the building that the sign is attached to. Practicing frequently helps build his or her confidence in learning new or large words, especially when you give praise. Reading menus in restaurants is fun and interesting. Help with the large words, but point out some words your child may already know so they can see them in use. You may even have your five-year-old read his or her order to the waiter.